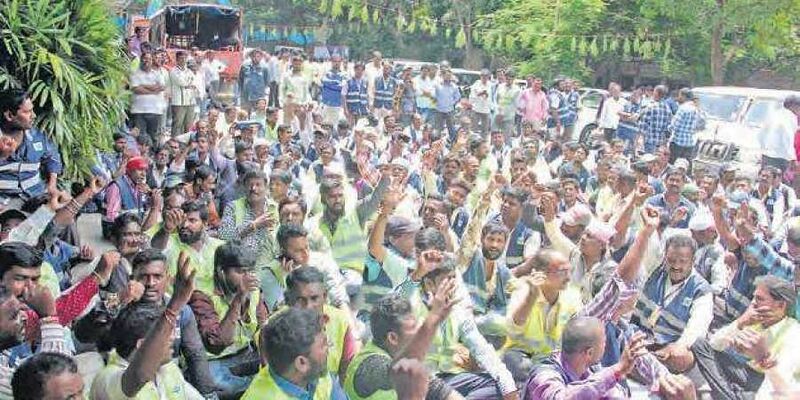 On Thursday, hundreds of sanitation, entomology and transport wing workers who gathered at the GHMC head office, Tank Bund were taken into custody by of police, and were shifted to police stations. HYDERABAD: The day-to-day sanitation works were partly affected in Greater Hyderabad limits on Thursday with Greater Hyderabad Municipal Employees Union (GHMEU) going on a strike Wednesday onwards.GHMC Commissioner M Dana Kishore, along with GHMC officials, held a meeting with GHMEU president Udhaari Gopaal and other office bearers. Dana Kishore assured the union leaders that demands pertaining to GHMC would be addressed while certain issues concerning the government would be taken up at the government level. Based on the assurance given by Commissioner, GHMEU decided to attend to emergency services but announced to continue their protest demonstrations at Circle and Zonal offices if their demands are not addressed.